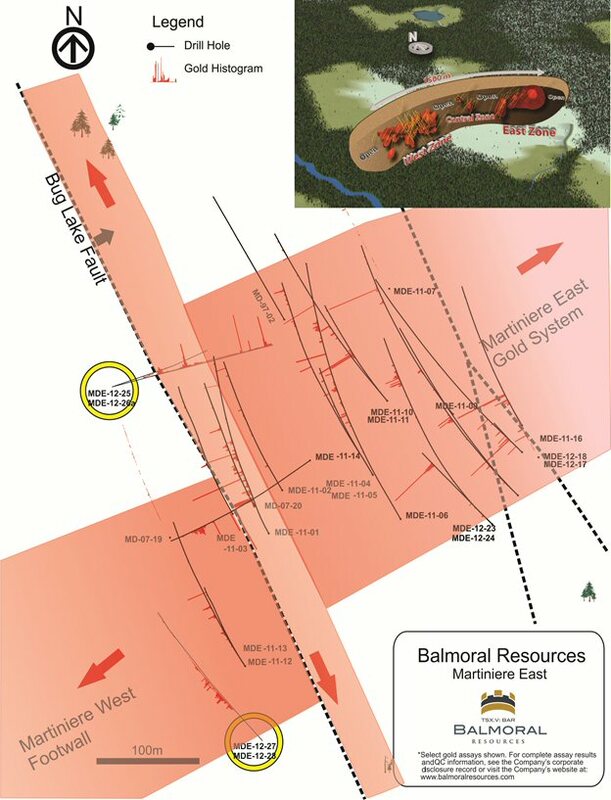 VANCOUVER, BRITISH COLUMBIA–(Marketwire – June 1, 2012) – Balmoral Resources Ltd. ("Balmoral" or the "Company") (TSX VENTURE:BAR)(OTCQX:BALMF) today announced additional drill results from the Martiniere East area of the Company's Detour Trend Gold Project. All four holes for which results were reported intersected significant gold mineralization highlighted by intercepts of 53.00 metres grading 0.88 g/t, 44.60 metres grading 0.97 g/t gold and high-grade intercepts of 6.10 metres grading 5.42 g/t gold and 3.30 metres grading 7.53 g/t gold. Results include two holes testing gold mineralization the NNW trending Bug Lake Fault and two holes which expand and enhance a fall 2011 discovery in the footwall to the Martiniere West/Central gold system. Drilling is set to resume on the Detour Trend Gold Project during the second week of June, 2012. Identification of a third, broad, gold bearing structural zone – "Bug Lake Fault" – on the Martiniere Property, defined over 150 metres of strike length and open in all directions. First high-grade, Martiniere West style, gabbro hosted intercept east of Bug Lake Fault – potential eastward continuation of Martiniere West/Central system? "Today's results continue to expand the gold system in the Martiniere East area and serve to again highlight the abundance of gold mineralization and opportunities associated with this emerging discovery," said Darin Wagner, President and CEO of Balmoral Resources Ltd. "While additional drilling will be needed to firm up our current working model, the confirmation of significant gold mineralization along the Bug Lake Fault has important implications for the future exploration of our entire Detour Gold Trend Project." The north-northwest trending Bug Lake Fault separates the Martiniere West and Martiniere East areas. Gold mineralization occurs on both sides of this fault system with the high-grade, gabbro-hosted Martiniere West/Central Zones to the west and the numerous, volcanic hosted gold occurrences comprising the Martiniere East area to the east. To date six holes (see table below), including holes MDE-12-25 and MDE-12-26 reported herein, have intersected gold mineralization along or proximal to the Bug Lake Fault. Collectively these holes define a new gold bearing trend, roughly at right angles to the Martiniere West and East trends, which has now been intersected for 150 metres along strike at shallow depths and which remains open in all directions. Similar oblique to cross-cutting gold bearing structures are known in the Detour Gold deposit area 45 km to the west. (d) Historic hole, American Bonanza Press Release August 21, 2007. In addition to intersecting gold mineralization over a broad interval in associated with the Bug Lake Fault, hole MDE-12-25 cut, and was terminated within, a second gold mineralized interval. This deeper gold intercept is hosted within a gabbro intrusion and strongly resembles the high-grade Martiniere West Zone. As with Martiniere West it is characterized by several high-grade intercepts, 25.30 g/t gold over 0.35 metres, 6.72 g/t gold over 0.50 metres and 7.53 g/t gold over 3.30 metres, within a broader halo of strongly anomalous gold mineralization. This is the first intercept of this nature recognized east of the Bug Lake Fault. Holes MDE-12-27 and MDE-12-28 were drilled into the footwall of the West Gabbro (host to the Martiniere West Zone) to follow-up two broad, gold mineralized intercepts from the fall 2011 program in the same area (holes MDE-11-12 and MDE-11-13). Both holes, collared from the same location and drilled at different dip angles, intersected a broad zone of gold mineralization from the bedrock interface down returning intercepts of 0.88 g/t gold over 53.00 metres and 1.33 g/t gold over 17.60 metres. These results expand on the 2011 discovery and confirm the presence of significant gold mineralization hosted by the volcanic rocks in the footwall to the West Gabbro, and area which is largely untested on the Property. Balmoral's Martiniere Property is part of the Company's Detour Gold Trend Project which extends for 82 kilometres along the gold bearing Detour-Sunday Lake Deformation Zone in Central Quebec. In addition to the Martiniere gold discoveries, the Project includes the near-surface Lynx and Rambo Gold Zones on the Detour East Property, the high-grade Fenelon Gold Zone and new gold and nickel-copper-PGE discoveries on the Grasset Property. Results from the final 8 drill holes from the winter drill program at Martiniere West remain pending. Six holes have now also been completed on the Company's Northshore Property in Ontario for which results remain pending. Mr. Darin Wagner (P.Geo. ), President and CEO of the Company, is the non-independent qualified person for the technical disclosure contained in this news release. Mr. Wagner has supervised the work programs on the Martiniere Property, visited the property on multiple occasions, examined the drill core from the holes summarized in this release and reviewed the available analytical and quality control results. Balmoral has implemented a quality control program for all of its drill programs, to ensure best practice in the sampling and analysis of the drill core, which includes the insertion of blind blanks, duplicates and certified standards into sample stream. NQ sized drill core is saw cut with half of the drill core sampled at intervals based on geological criteria including lithology, visual mineralization and alteration. The remaining half of the core is securely stored on-site at the Company's Martiniere, Detour East or Fenelon camps in Central Quebec. Drill core samples are transported in sealed bags to ALS Minerals Val d'Or, Quebec analytical facilities. Gold analyses are obtained via industry standard fire assay with atomic absorption finish using 30 g aliquots. For samples returning greater than 5.00 g/t gold follow-up analysis fire assay with a gravimetric finish is completed. The Company has also requested that any samples returning greater than 10.00 g/t gold undergo screen metallic fire assay. Base metal and silver analyses are performed at ALS Minerals North Vancouver, B.C. facility via industry standard 35-element ICP-AES with and aqua regia dissolution. Base metal values returning >1% are automatically re-assayed by standard fire assay. Following receipt of assays visual analysis of mineralized intercepts is conducted and additional analysis may be requested to ensure the accurate representation of mineralized zones. ALS-Minerals is an ISO 9001-200 and ISO 17025 certified laboratory. This press release contains forward-looking statements and forward-looking information (collectively, "forward looking statements") within the meaning of applicable Canadian and United States securities laws. All statements, other than statements of historical fact, included herein, including statements regarding the anticipated content, commencement, duration and cost of exploration programs, anticipated exploration program results, the discovery and delineation of mineral deposits/resources/reserves, the timing of the receipt of assay results, and business and financing plans and trends, are forward-looking statements. Forward-looking statements are typically identified by words such as: believe, expect, anticipate, intend, estimate, postulate and similar expressions or are those which, by their nature, refer to future events. Although the Company believes that such statements are reasonable, there can be no assurance that such statements will prove to be accurate, and actual results and future events could differ materially from those anticipated in such statements. The Company cautions investors that any forward-looking statements by the Company are not guarantees of future performance, and that actual results may differ materially from those in forward-looking statements. Important factors that could cause actual events and results to differ materially from the Company's expectations include those related to weather, equipment and staff availability; performance of third parties; risks related to the exploration stage of the Company's projects; market fluctuations in prices for securities of exploration stage companies and in commodity prices; and uncertainties about the availability of additional financing; risks related to the Company's ability to identify one or more economic deposits on the properties, and variations in the nature, quality and quantity of any mineral deposits that may be located on the properties; risks related to the Company's ability to obtain any necessary permits, consents or authorizations required for its activities on the properties; and risks related to the Company's ability to produce minerals from the properties successfully or profitably. Trading in the securities of the Company should be considered highly speculative. All of the Company's public disclosure filings may be accessed via www.sedar.comand readers are urged to review these materials, including the latest technical reports filed with respect to the Company's mineral properties. Balmoral Resources Ltd., Vancouver, B.C.